The TV series Teahouse (based on Lao She’s play of the same name) unfolds around the lives of a Beijing teahouse owner Wang Lifa (left standing) and its patrons. 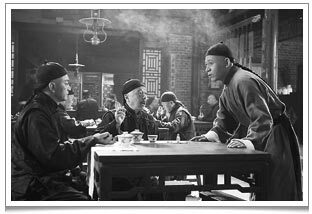 Their dialogue is full of the wit and humor characteristic of old Beijing. ‘Chaguan’ (茶馆 Teahouse) is a play by Lao She (老舍 1899-1966) which has recently been serialised in 39 episodes on Chinese TV. Lao She is one of the best loved writers of modern China, famous for his humour and irony. Most, if not all, of his works provide a panoramic view of Chinese history and culture in their transformation from tradition to modernity. I am lucky to have caught it on Phoenix TV Europe! Set in an old teahouse in Beijing, the story spans fifty years from the bourgeois Hundred Days of Reform in 1898, taking in the collapse of the Qing dynasty and the Republican Revolution led by General Yuan Shikai in 1912, the years of Kuomintang rule in the 20s and 30s, occupation by various foreign forces, and closing with the establishment of the communist People’s Republic in 1949. The play brings together over 60 vivid characters, representing all walks of life, and it’s very much about Beijing life and the lively culture and dialect of that great city. A clip from episode 1 of La She’s “Cha Guan” 茶馆 TeaHouse. 2 minutes 20 seconds into the clip, we see the scene of a busy Yutai teahouse where guests drink from gaiwans, playing chess and cheering a cricket fight. Like the Queen Vic in ‘Eastenders’ and the Rovers in ‘Coronation Street’, the Yutai (裕泰) Teahouse is where the characters in the story interact and share their tales, lives, loves and struggles. We follow Yutai teahouse owner Wang Lifa (王利发) and his customers during decades of turbulence and profound change in Chinese society. The play fleshes out the play’s leading characters and what the common people had to do to survive in terrifyingly crazy times. One day you could be punished as a republican for not wearing a pigtail, the next you might be beheaded as a monarchist for wearing a pigtail! Meanwhile, two local constables change their outward allegiance from one political era to the next, but throughout remain the same, essentially corrupt villains, always inventive when it comes to collecting ‘protection money’! In one poignant scene Wang Lifa visits a Western tea room on the other side of the city to ‘check out the competition’ after his customers rave about the ‘thick black tea’ (i.e. coffee), posh menu and western-style waiters there. Wang Lifa notices how the tables are laid out at an angle to make the room look bigger. He’s amazed to learn that the tablecloths are washed daily (such extravagance!) and he falls in love with ice cream! In the next scene, he is trying to import some of these innovations into the teahouse but the grumpy old tea server he employs isn’t inclined to cooperate. This old tea server has been working with the family teahouse for a long long time and has seen Wang Lifa grow up. While portrayed as a grumpy old man, he’s a source of much sage advice. He frequently reminds Wang Lifa of the adage that “he who passes into the door is a guest (and should be treated with respect)” (“Guo Meng Jiu Shi Ke” 过门就是客). This is what customer service is all about! The theme of gradual ‘changing with the times’ is handled with subtlety too, as the background wall hanging, a traditional brush painting of ‘eight drunken fairies’ (“Zui Baxian” 醉八仙), gives way to Hollywood film posters (I think I spotted Myrna Loy), beautiful, bare wooden tables are replaced by cloth-covered tables and a traditional story teller yields to a gramophone! I tend to agree with Wang Lifa, though, when he says that playing pop music in the teahouse was a slightly retrograde step! ‘Teahouse’ is a rare masterpiece of contemporary Chinese fiction. Its great charm is its closeness to the experiences of ordinary people and Lao She’s keen observation of life as it is actually lived. The TV adaptation is respectful and faithful to the spirit of the original and every detail – from how tea is served to the way greetings and jokes are exchanged to the colourful, expressive Beijing dialect – is well presented and authentic, a sheer joy!